Semtech (Nasdaq: SMTC), a leading supplier of high performance analog and mixed-signal semiconductors and advanced algorithms, and Imprint Energy, a company developing new battery technology for widely-deployed devices, announced a collaboration to accelerate the widespread deployment of Internet of Things (IoT) devices. 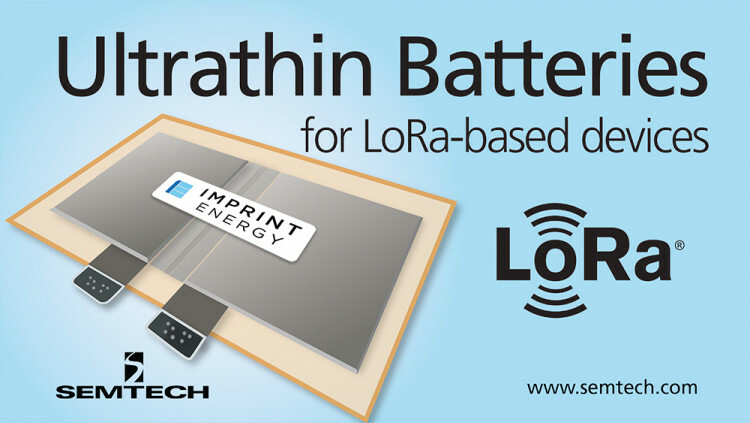 Imprint Energy will design and produce ultrathin, flexible printed batteries that are especially designed to power IoT devices integrated with Semtech’s LoRa® devices and wireless RF technology (LoRa Technology). LoRa Technology, with its long-range, low-power capabilities, is regarded by many as the defacto platform for building low-power wide area networks (LPWAN). To help accelerate a next generation of battery technology, Semtech has invested in Imprint Energy. The companies are working closely to target applications that have the potential to create entirely new markets. The Imprint Energy battery enables new applications which have a thin and small form factor and due to the integrated manufacturing process, the batteries are low cost to produce, making high volume deployments feasible. Additionally, a key benefit of the Imprint Energy battery technology is the ability to be printed using multiple types of conventional high-volume printing equipment; this allows quick integration by traditional electronic manufacturers in their existing production lines. Test production runs are currently being processed and the resulting batteries are being used in applications prototypes to validate assumptions and engage early adopters. Above: An Imprint Energy ultrathin battery, designed to power IoT devices using Semtech’s LoRa® technology. Semtech’s LoRa devices and wireless RF technology is a widely adopted long-range, low-power solution for IoT that gives telecom companies, IoT application makers and system integrators the feature set necessary to deploy low-cost, interoperable IoT networks, gateways, sensors, module products, and IoT services worldwide. IoT networks based on the LoRaWAN™ specification have been deployed in over 65 countries and Semtech is a founding member of the LoRa Alliance™, the fastest growing IoT Alliance for Low Power Wide Area Network applications. To learn more about how LoRa enables IoT, visit Semtech’sLoRa site and join the LoRa Community to access free training as well as an online industry catalog showcasing the products you need for building your ideal IoT application. Imprint Energy is a widely-recognized leader in ultrathin, flexible, printed batteries for always-connected Internet of Things products, including smart labels, health and wellness sensors, and flexible displays. Imprint Energy’s proprietary ZincPoly™ chemistry has higher energy density, is safer, and can power communications better than thin lithium batteries. Imprint Energy is already sampling thousands of batteries and multiple partners have printed batteries using their own equipment. Imprint has received extensive recognition, including the MIT Technology Review Innovators under 35 and 50 Smartest Companies. To learn more, see www.imprintenergy.com. All statements contained herein that are not statements of historical fact, including statements that use the words “to accelerate,” “will,” “designed to,” or other similar words or expressions, that describe Semtech Corporation’s or its management’s future plans, objectives or goals are “forward-looking statements” and are made pursuant to the Safe-Harbor provisions of the Private Securities Litigation Reform Act of 1995, as amended. Such forward-looking statements involve known and unknown risks, uncertainties and other factors that could cause the actual results of Semtech Corporation to be materially different from the historical results and/or from any future results or outcomes expressed or implied by such forward-looking statements. Such factors are further addressed in Semtech Corporation’s annual and quarterly reports, and in other documents or reports, filed with the Securities and Exchange Commission (www.sec.gov) including, without limitation, information under the captions “Management’s Discussion and Analysis of Financial Condition and Results of Operations” and “Risk Factors.” Semtech Corporation assumes no obligation to update any forward-looking statements in order to reflect events or circumstances that may arise after the date of this release, except as required by law. Semtech, the Semtech logo, and LoRa are registered trademarks or service marks, and LoRaWAN is a trademark or service mark, of Semtech Corporation or its affiliates.